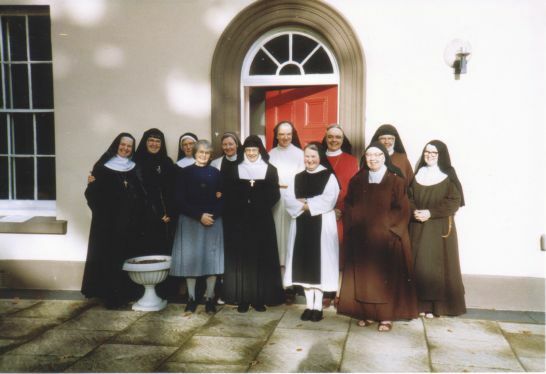 The Association (ABC) developed out of a meeting of the contemplative nuns of England , Scotland and Wales in November 1992 for the purpose of responding to the Lineamenta for the 1994 Synod on the Consecrated Life. Representatives of the Anglican communities were also present. At that meeting the representatives jointly drafted and signed a letter to the late Cardinal Hume, notifying their intention to build on the fruitful mutual exchange established at the meeting by forming an Association of British Contemplatives. Statutes were drawn up and in 1994 were approved by the competent authorities. Membership of the Association is for canonically erected communities and not for individuals. Many Orders have such groups as oblates, tertiaries, companions, associates etc. and individuals who wish to live a contemplative life 'at home ' may find them helpful. Since its approval the Association has embarked on 3 significant initiatives. In 1997 a poster campaign was promoted which reminded people that the contemplative vocation is alive and well in the Church today. In 1999 a meeting of contemplative nuns and monks was held in York to celebrate the new millennium. Then in 2004, as a by product of the poster campaign, a Directory of Contemplative Orders for Women was printed. Great interest was shown at the time of the poster and requests for information about all the Orders showed there was a need for such a booklet. 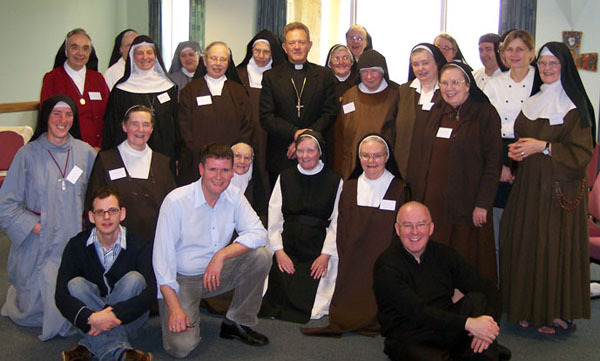 Now in 2006 the Association is appearing on the website, hopefully to coincide with the BBC's programme THE CONVENT which will be shown on BBC2. To make it easier to give information about the Orders in case of interest from viewers the whole of the Directory follows this short introduction to the ABC. All the contemplative nuns in the Association will be pleased to pray for any special intentions, if visitors to this site wish to make them known to us. Again a very fruitful meeting with the added pleasure of meeting the Apostolic Nuncio, Archbishop Faustino Sainz Munos, who came for mass with the group and then stayed for lunch and an informal meeting afterwards. 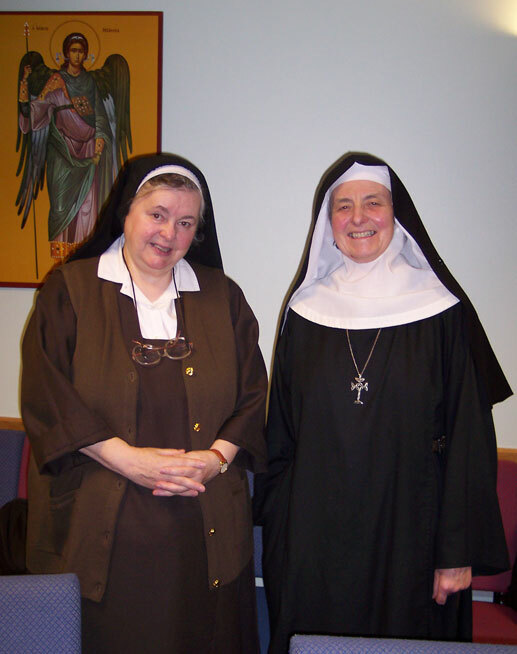 Sister Mary of the Holy Spirit who was re-elected Chairwoman, and Abbess Joanna Jamieson who was re-elected Deputy. All the participants who attended the meeting with the Apostolic Nuncio Archbishop Faustino Sainz Munos, and some of the staff at Myddleton Grange. Books on contemplation and prayer abound but information about Contemplative Orders is not that easy to obtain. There is a need for this as many people are not aware there are so many Orders and convents. The Association of British Contemplatives has therefore collected together brief accounts of the contemplative Orders who reside in the United Kingdom to produce this Directory. The Directory hopefully gives a "flavour" of the many different charisms and should help enquirers to come to a better understanding of this important way of life in the church today. More information about each order can be obtained by writing to or emailing the addresses given or by vising their individual websites. Since compiling the Directory some convents have had to close, for a variety of reasons, but we have left their names in for the moment. Where possible we have indicated the address of the nearest convent of an order in Europe - for anyone wishing to join that particular Order. We will continue to update as needed.